Flaring and venting are methods of burning or releasing associated gas which is treated as a waste product from an offshore installation or gas terminal. This is necessary for maintaining process safety or for disposal of gas which it is technically or economically impractical to collect and transport. Greenhouse gas emissions from oil and gas production are currently covered by the European Union Emissions Trading Scheme (EU ETS) Directive 2003/87/EC. The monitoring and reporting regulation (MRR Phase III) was implemented in January 2013. 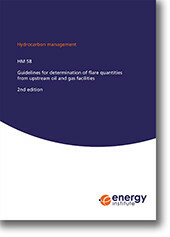 This second edition of HM 58 has been developed to provide up-to-date guidance on the application of measurement techniques and principles needed to comply with the current EU ETS requirements for the trading of flared quantities discharged from facilities involved in the upstream oil and gas industry. This publication is intended for measurement specialists, environmental personnel and operations management principally within the UK upstream oil and gas industry. It will also be a valuable aid to similar personnel from other countries where controls on discharges from flares are being enforced.